I’m not sure about you, but since being immersed into the world of cupcakes, nothing is impossible, those little things once in your life are hard to get rid of. I guess we love them even more because they’re inexpensive to make, can be made in batches of twelve, our creative mind and hands can do their work and best of all they’re portioned sized…right! We take one, no more, just one and indulge in a decadence of flavours, frostings and taste sensations. All under control! 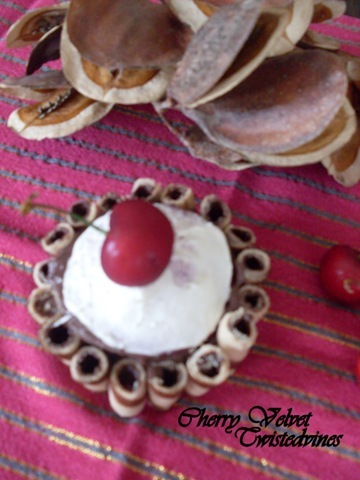 I wanted to put a little pizzazz on that little cupcake…made for ‘little’ grown ups and a little surprise for those taste buds. 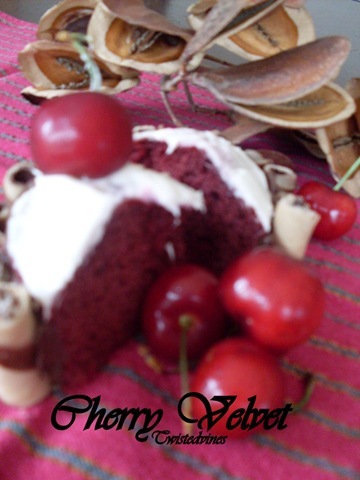 A red velvet cupcake mix, with a surprise dash of kirsch, cream cheese frosting and chocolate Monetta luxury cream wafers. How does that sound to get your taste buds tingling! An easy entertainer…and a great eye teaser! 60g unsalted butter, room temp. Line a 12 hole cupcake tine with patty cases. Preheat oven to 170°C. Place butter and sugar into a medium bowl and with electric mixer blend until light and fluffy.Keep beating and gradually add the beaten egg continue mixing until well blended. In a small bowl mix together cocoa powder, red food colouring and the vanilla extract mix until it makes a thick paste. Add this paste to the butter mixture and continue beating until the coloured paste in blended thoroughly through. The mixture now will be a red deep luscious colour. Using a wooden spoon add half of the buttermilk and fold in half the flour. Repeat, and mix well. Add the salt, bicarbonate soda and vinegar, mix for about a minute. Kirsch is a delicious stoned based brandy. The crushed kernels of the fruit are included with the fruit juice before fermentation as they infuse the brandy with a fine, bitter tang. It is clear, unsweetened and colourless The palate is strong and penetrating, finishing with a sharp acid cherry flavour. Spoon into the cupcake cases filling them half way, a great even measurement is to use an ice cream scoop. Bake in oven for 20-25 minutes. When cooked leave to cool fully on a wire rack. Tip: Never leave the cupcakes to stand in the cake tin as moisture will form. When the cupcake has fully cooled…lets decorate! 50g unsalted butter, room temp. 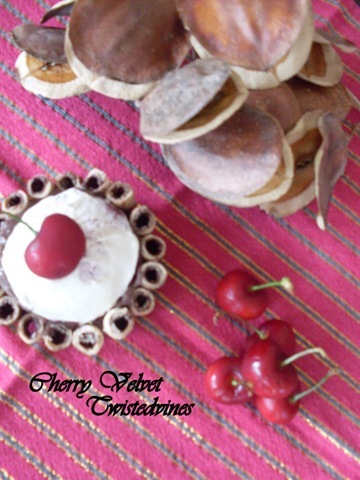 In a bowl, cut the cream cheese into cubes, add the icing sugar and butter and blend continuously with an electric mixer until creamy, for about five minutes.Place on top and sides of cupcake, cut the wafer sticks to height size of cupcake and garnish with a fresh glossy cherry. 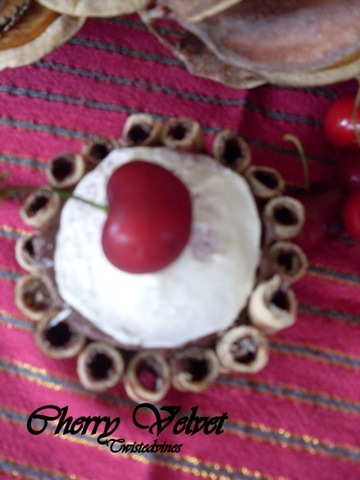 Now this a seriously decadent and most beautiful cupcake Yvette, almost too beautiful to eat! These cupcakes look incredible and are so beautifully presented. Another great post! Thanks Pat, for calling by…Cupcakes are so versatile and appealing to also us adults! Have a great day! Mmmm…Mm! My tastebuds are tingling, Sounds so good, and I must say looks delicious! And the pretty striped material sets it off lovely.